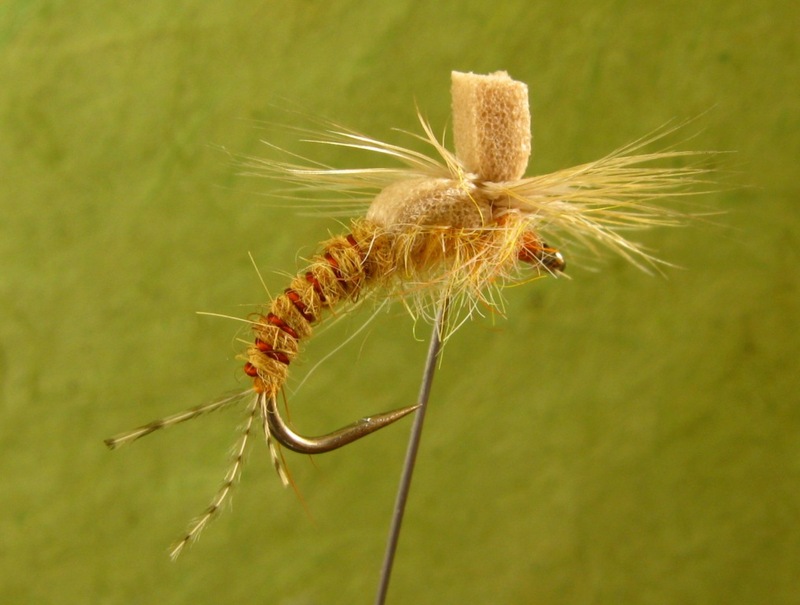 Some years ago a fly tier named Tom Travis of Montana, created an excellent series of parachute emergers for Orvis covering a number of the major mayfly species. Back about 2004 or ’05 I had one of my customers request this pattern, and he gave me a printed copy of a magazine article with tying instructions and pattern recipes. I went ahead and started to tie some of these; March Browns, Sulphurs, and cornuta BWO’s. I made a few modifications, some immediately, and others along the way. This pattern is a very good one. Recently one of my customers had terrific success on Pennsylvania’s Spring Creek with my version of the Sulphur Para-emerger. http://www.flycastingschool.com/ You’ll also want to check out the two special guests he has booked for this fall; Tim Rajeff in September and April Vokey in October. Click on Guest Instructors on his site for more information. Sulphur Para-emerger. 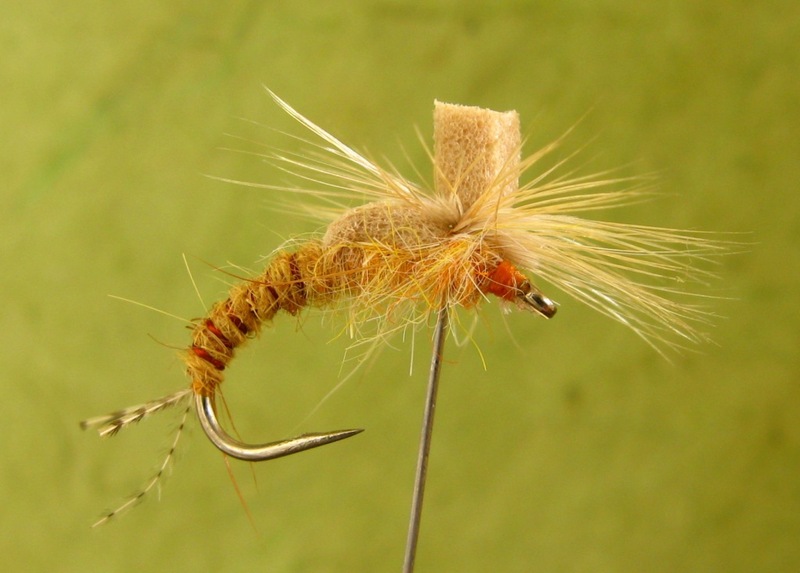 This fly is designed to float as a dry fly while the abdomen suspends below the surface film. It is intended to mimic the mayfly nymph emerging at the surface, or perhaps a cripple. This design makes for a highly effective trout pattern. Trout feeding on duns will nearly always inhale this pattern. Note the picked dubbing in the thorax represents legs. Hook: Size #12 and #14 – Tiemco 2488 or 2487 Scud Hook. This hook is a Montana Fly Company 7048 Light Wire Scud Hook, size #12. These scud hooks are 2x short shank, hence the #12. The 2x wide gape of these hooks increases hookups. The Orvis patterns are dressed on the 2488 straight-eye hook, which is probably the best choice. Tail: Three barbs of lemon wood duck, divided with two wraps. Rib: A single strand of Danville No. 47 Tobacco Brown rayon floss, twisted tight. Note its appearance is similar to wire. Twisted floss is very durable. Abdomen: Hareline #43 Ginger rabbit dubbing. Wingcase: Tan closed-cell foam, cut into strips about 3-/32″ wide. Thorax: Sulphur Rabbit Dubbing, this is color No. 6, the brand sold by Fishing Creek Angler in Benton, PA. Check their link under Fly Shops. Hareline Nos. 27 or 28, Amber or Antique Gold, could be used. Or blend colors to get something close to this shade. Post: Created from the same section of foam as the wingcase, tied in with three wraps, make some thread wraps and apply a bit more dubbing in front to elevate it, and then wrap tying thread around the foam post to create a base for attaching the hackle. Hackle: Ginger. This is a Whiting Saddle; only three wraps are needed because of the high barb density. Head: Orange, made from the tying thread. On the wood duck tail, I use the barbs that have previously had the tips used for something else, such as the wings on Catskills dry fly patterns. Noted Catskill fly tier, Dave Brandt, from Oneonta, New York, sells what he markets as “Pre-Owned Wood Duck.” About 1996 or ’97, considering the expensive cost of wood duck flank feathers, I developed several different methods on a number of fly patterns to achieve total utilization of wood duck flank feathers and all the barbs, where little to none of the feather and barb stubs goes to waste. Like hog butchering where it is said, “They use everything except the squeal,” so I have done with the lemon and barred wood duck feather barbs. No wood duck feather is ever discarded until there is literally nothing left to use it on. For now this is all I shall write on this post. I will add the tying instructions early next week, since my day is starting and time is getting away from me. I will add the second photo below, of a slightly different camera angle to reveal the three-barbed tail. Have a good weekend everyone! Sulphur Para-emerger, Don Bastian version. Note the three-barbed tail. This requires a little more effort, but I believe it is worth it. My tri-focal lenses and 20/15 corrected vision helps a lot. The use of my fingers, and occasionally a bodkin allows me to divide these barbs with just 2 wraps of tying thread. Then the rib is attached and dubbing of the abdomen begins. While this fly is technically classed as an emerger, standard dry fly tactics are employed when fishing it. Often to state one is “fishing an emerger,” it seems to default to the use of a sub-surface pattern. This is not always entirely true. Step 1: First I insert the scud hook into the vise with the hook point and eye pointing directly down. This places the heel of the bend facing up. I do this because it allows me to attach the tail and tie the abdomen well down the hook bend. I attach the tying thread at a position that would amount to being above the barb if the hook were normally placed in the jaws of your vise. Start tying thread and wind enough wraps to secure it to the hook. Step 2: If you are going to use three barbs of lemon wood duck flank as I do, then your bodkin will be invaluable in selecting the barbs from the feather. Many of the pieces of lemon wood duck that I have are no longer on the stem, they are just barbs in groups of several to a couple dozen, all that remain after being used for tails on wet flies, wings on drys, legs on nymphs, or stripped off from flank feathers that were used for shoulders on patterns like Carrie Steven’s Green Beauty or the Larry. I keep these in a small zip-loc bag. Take the three barbs and attach them to the hook. Use your bodkin and your fingers to splay them and then make two wraps on either side of the center barb. I generally clip the two side tails a tad shorter than the center barb. You could also save time by just tying in a small bunch of barbs. This is easier, but I believe it would result in the loss of trigger point No. 1 on this pattern, and by that I mean the realistic-looking three-fibered tail. Step 3: Attach a single strand of Danville #47 Tobacco Brown floss for the rib. At this stage, change the placement of the hook in the vise to a more traditional horizontal position. Step 4: Apply the abdominal dubbing to the thread, I use Ginger #43 Hareline Rabbit Dubbing. Using the photo as a guide dub slightly more than half the hook shank for the abdomen. Step 5: Grasp the floss rib and (for right-handed tiers) twist the floss clockwise, just enough to gather it together so you can grasp the tip of it with your hackle pliers. Now you can really spin the floss; twist the rib clockwise several more times. This will insure that the floss increases in twist as it is wound. Left-handed tiers would need to twist the floss counter-clockwise to tighten it. Wind the ribbing, making at least six wraps. Step 6: Tie in the closed-cell foam strip (previously prepared as per the recipe and material list above) at the base of the abdomen. Step 7: Apply dubbing to the thorax area, winding it forward but staying back away from the hook eye about twice the hook eye diameter. Step 8: Bring the foam wing case forward, secure it with a few wraps of tying thread. Make 10 – 12 wraps in front of the foam, standing it up to create the post. Make 10 – 12 thread wraps around the base of the foam post to create a band of thread for attaching the hackle. Step 9: Apply a small amount of dubbing in front of the post. I hope that my readers will tie and try this pattern. I’d love to hear success stories too! Set the hook!